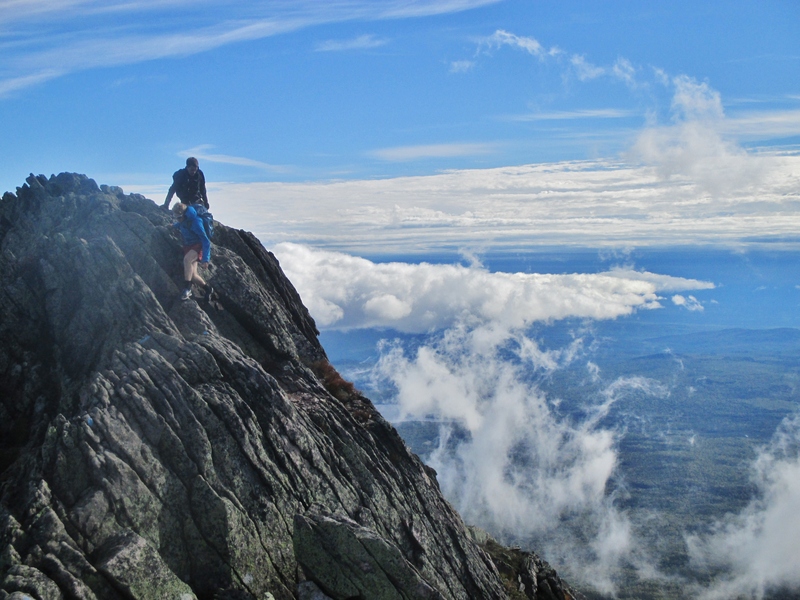 One of the goals for my month in Maine was to climb Mt. 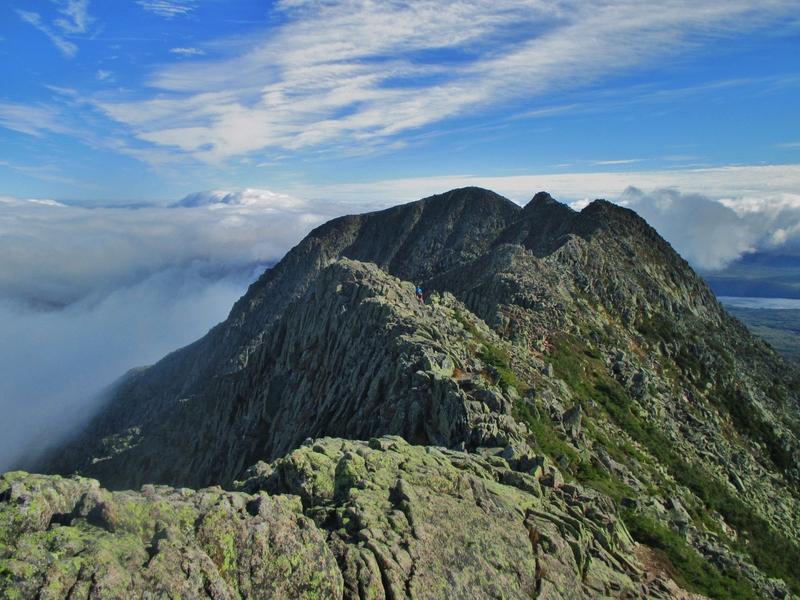 Katahdin – the highest point in Maine and the northern terminus of the Appalachian Trail. 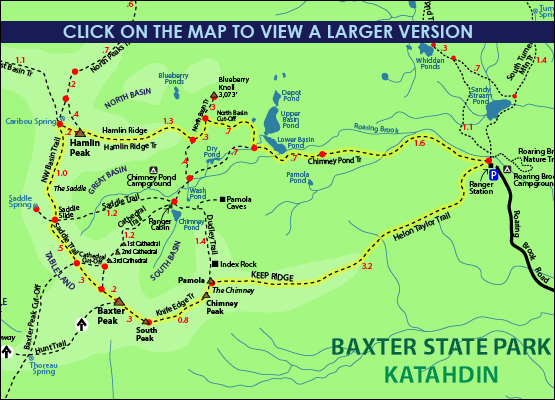 The mountain is situated within Baxter State Park, which restricts the number of hikers per day using a reservation system for parking spots. This makes for a great climbing experience (I only encountered a handful of other people all day), but requires some advanced planning. 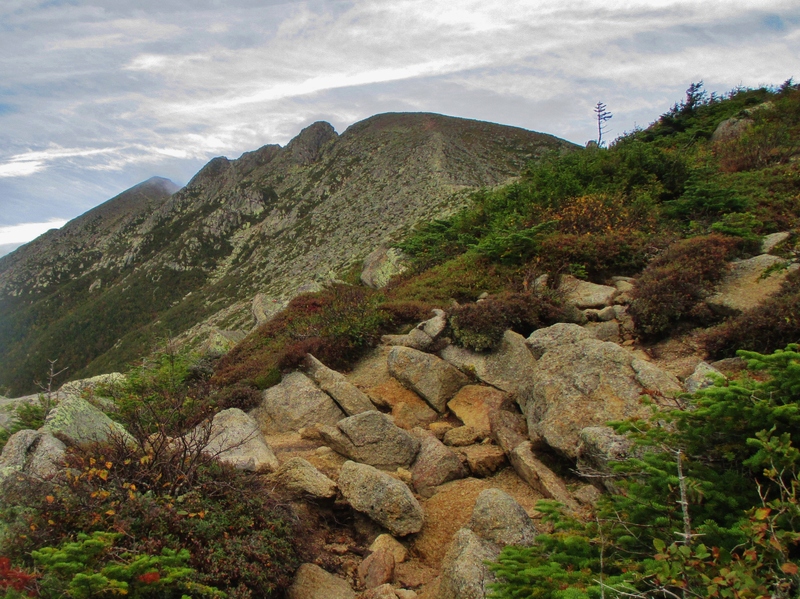 I opted to leave from the Roaring Brook trailhead, ascending via the famous Knife Edge trail and returning via the Chimney Pond trail. I left Portland, Maine at 2:00 am, reached the park gate around 5:40 am, waited 10 minutes or so for the park to open, and began hiking at 6:30 am. 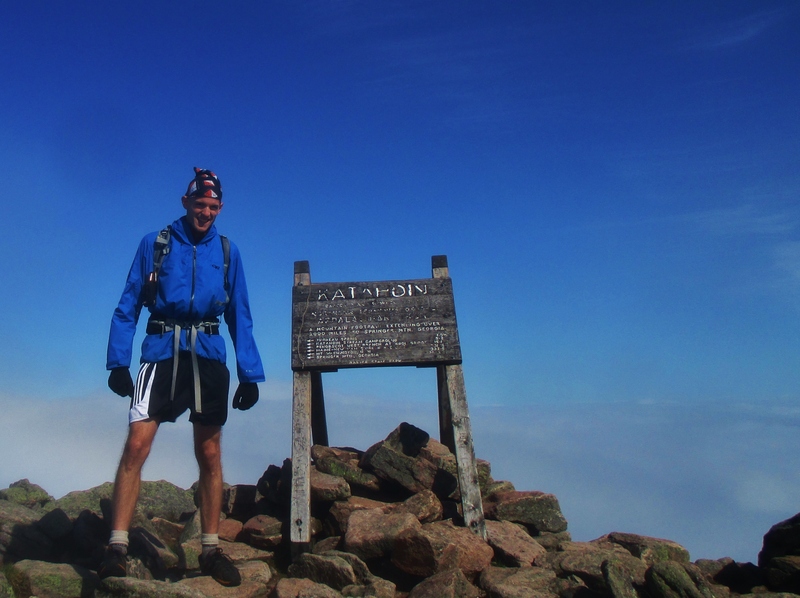 I ran into some rain showers during the first few miles, but these cleared up around the time I reached treeline. 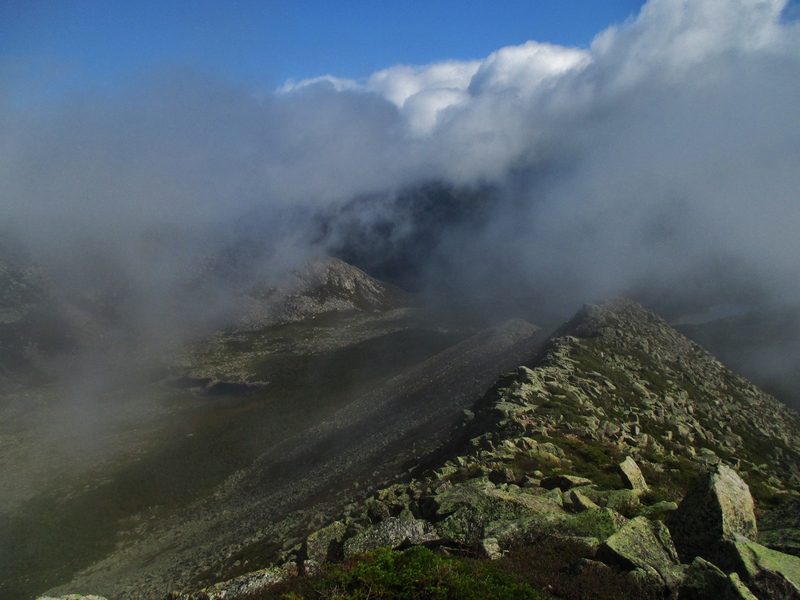 The trail was very rocky (as per usual) but reasonably gradual until I reached the summit of Pamola Peak (4,902′). Summit of Pamola; The Knife Edge route can be seen off to the left. 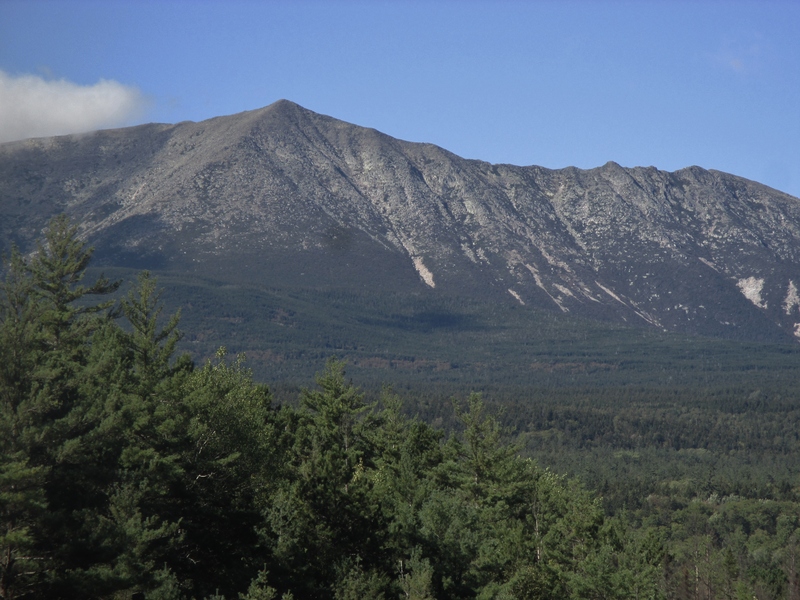 Katahdin on the right. 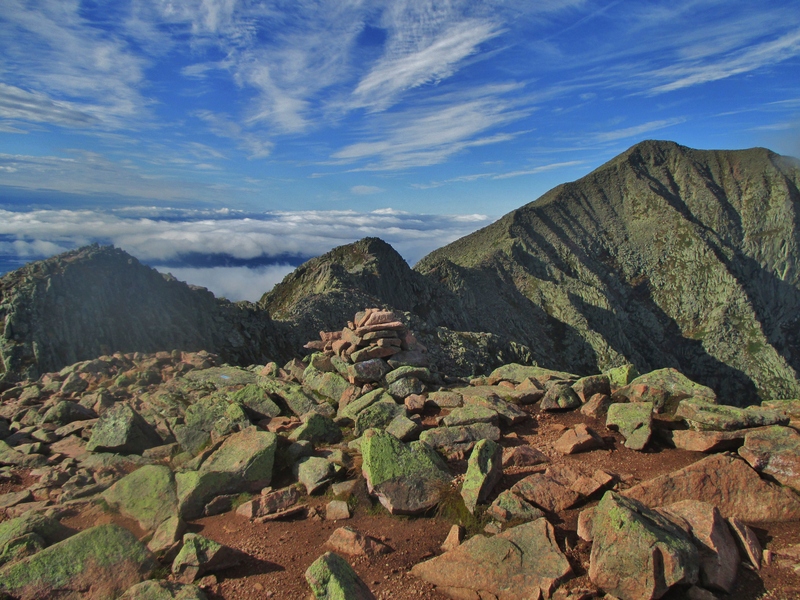 The final 1.1 miles to the summit of Katahdin was hands-down the most exciting (i.e. challenging) section of the day. 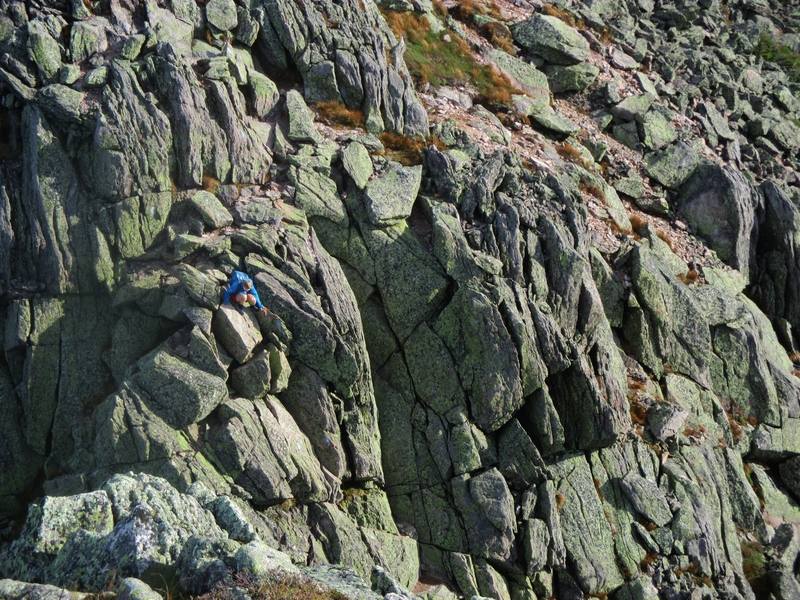 The route followed a narrow ridgeline, with varying degrees of exposure and a few very short sections requiring class 3-4 scrambling. The initial downclimb/upclimb from Pamola to Chimney Peak was probably the toughest section. Another climber navigating the downclimb from Pamola. It was also very windy, though not nearly as bad as I encountered on Mt. Madison last week. Probably a steady 25-30 mph on the ridge, with occasional 50mph gusts. And of course the gusts always seemed to hit when I stood upright on narrow sections. 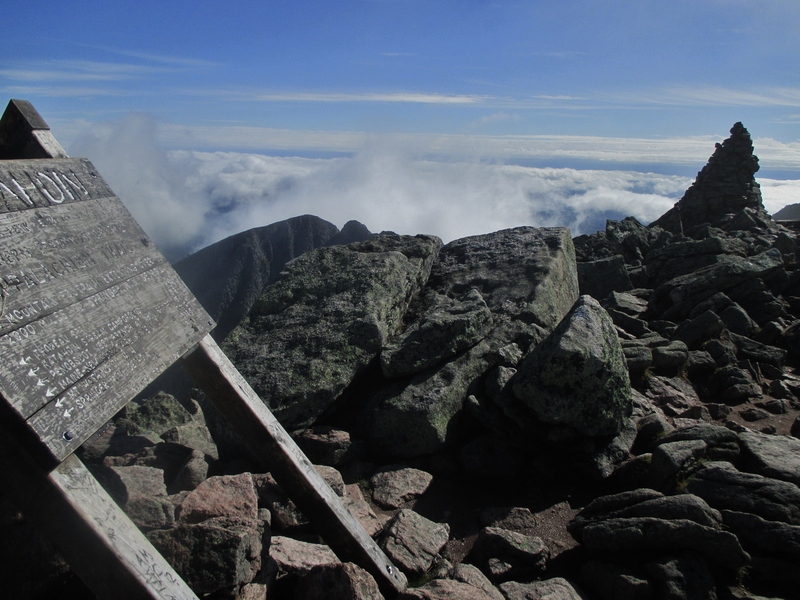 I made it to the summit of Katahdin (5,270′) in just under 4 hours, where I took the obligatory photo next to the sign marking the end of the Appalachian Trail. 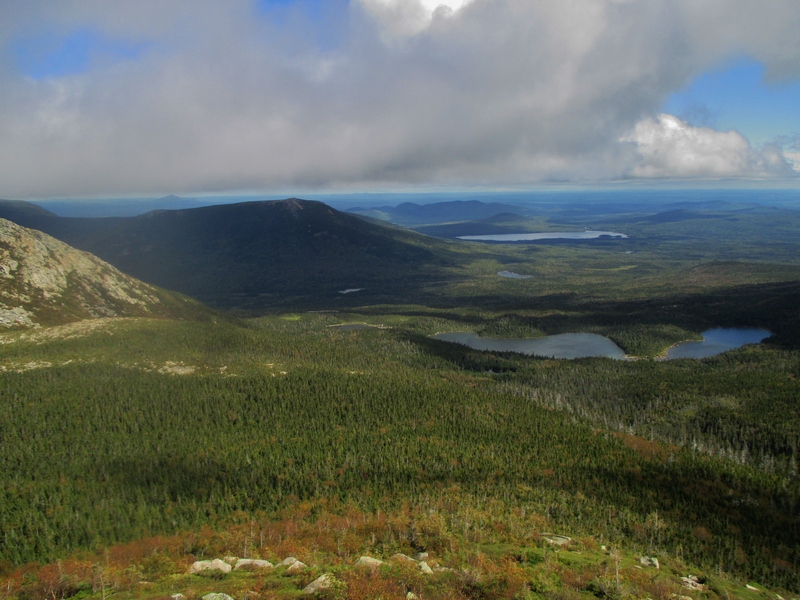 View from the top of Katahdin. Pamola can be seen in the distance. Most of the rest of the day was spent in a heavy fog, so I didn’t get great pictures. 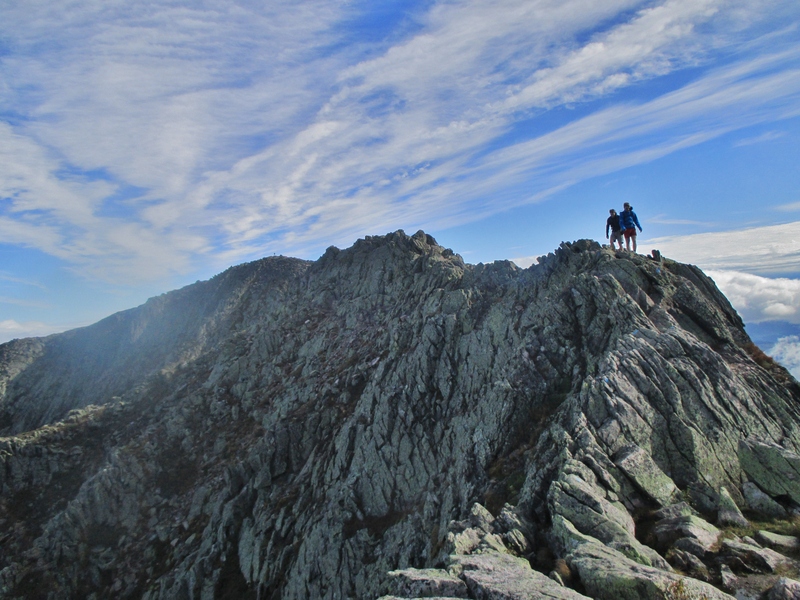 Took another 50 minutes or so to reach Hamlin Peak (4,751′), then started the long descent. Made it back to my car in a total time of 7 hours 40 minutes. Ballpark distance was 12 miles with 4,000′ elevation gain. I wasn’t going at a crazy fast pace by any means, but the early afternoon finish allowed me make it back to Portland in time for a full night’s sleep. 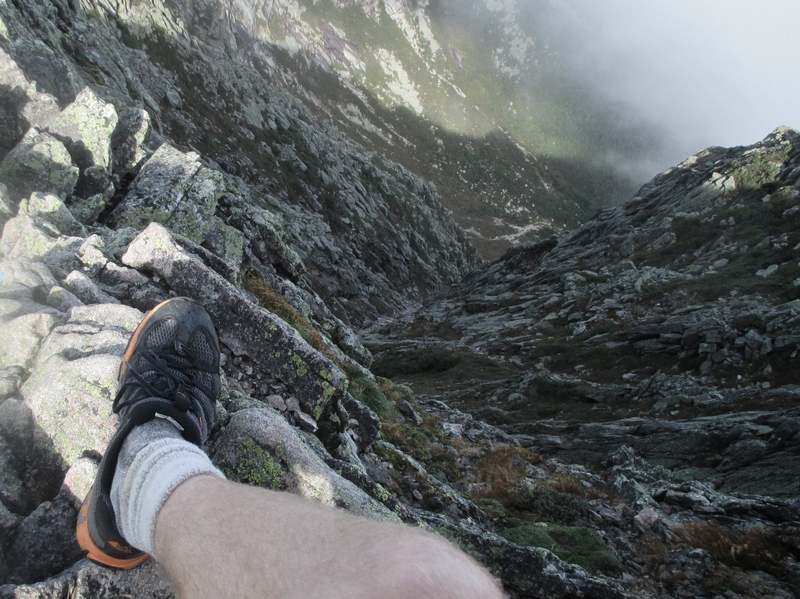 My legs were pretty sore when I made it back to the apartment (even more so the next morning)…but I knew that I only had one more day off before heading back to Wisconsin…so I decided to take one last stab at the Presidential Traverse the following day. I’ll try to get that post written up within the next few days.